Unraveling the Big Bang. Laying the foundation for tomorrow’s technology. Using some of the world’s coolest, most innovative and most expensive scientific facilities. Students and faculty involved in NIU’s High Energy Physics program, which conducts research on the most fundamental particles and interactions of matter, are doing all of the above. “Any small contribution I make might help scientists make new discoveries. 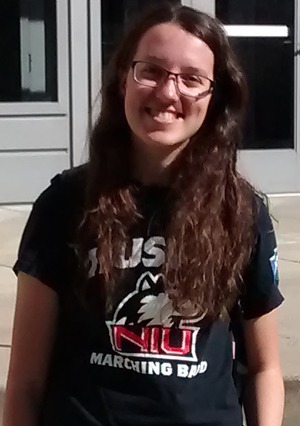 As an undergraduate, that’s a pretty big deal,” says Alison Peisker, an NIU senior majoring in physics and math. Working alongside NIU professors since last fall, Peisker is paid to conduct research for a $270 million project under development at Fermi National Accelerator Laboratory in Batavia. This fall, NIU’s High Energy Physics (HEP) program is flexing some extra muscle after receiving three new National Science Foundation grants totaling $1.77 million over the next three years. That’s more than double the amount of NSF funding in the previous three years for the NIU program. “This is remarkable growth at a fiscally challenging time when high energy physics programs at many other universities are experiencing funding cuts,” says physicist Gerald Blazey, interim vice president of NIU’s Division of Research and Innovation Partnerships. 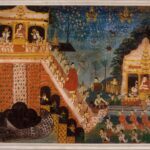 Two of the grants were awarded to first-year faculty, professors Jahred Adelman and Vishnu Zutshi. “Winning highly competitive awards of this size in one’s first year on the faculty is no small feat,” physics chair Laurence Lurio says. 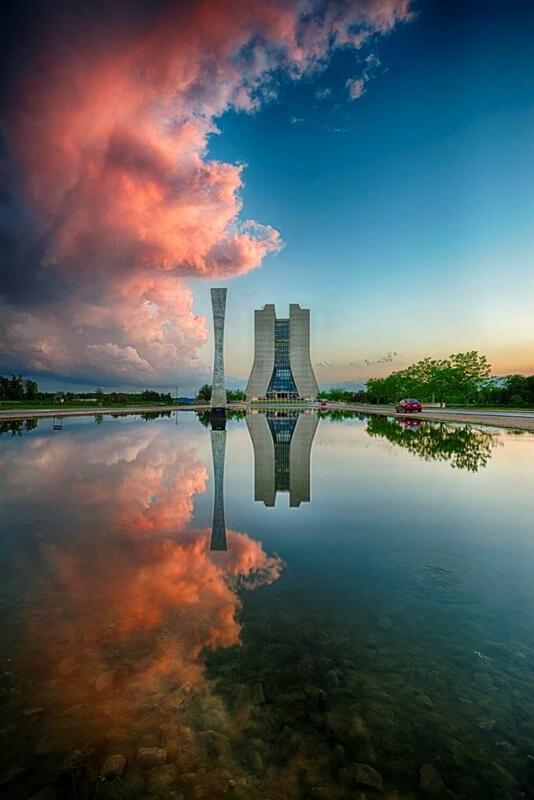 NIU scientists and students involved in the HEP program conduct research on campus as well as at Fermilab and at CERN near Geneva, Switzerland. The birthplace of the World Wide Web, CERN is Europe’s premier research center in physics. 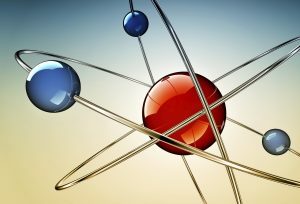 “Beyond gains in basic scientific knowledge, the technologies developed from high energy physics research can be expected to continue to lead to momentous advances in a wide range of areas that touch our everyday lives,” says physics professor Dhiman Chakraborty, who works with NIU students at CERN and is among the grant winners. “These areas range from medical science and information technology, to finding new sources of clean energy and developing new materials, to modeling financial markets and the fight against terrorism,” Chakraborty adds. The funding will expand research experiences for students such as Peisker and ramp up faculty research on the Fermilab project known as Mu2e, one of the flagship experiments of the U.S. HEP program. By seeking to find a rare type of conversion of particles known as muons to electrons, the experiment will look for new phenomena beyond the Standard Model of particle physics. Zutshi, who joined the faculty last fall, is the principal investigator for the award. He has worked in leadership roles at Fermilab and CERN on fixed target and collider experiments and leads the NIU detector development group that has made pioneering efforts in scintillation detectors for particle physics and medical imaging. On Mu2e, he is taking on key responsibilities for the crucial Cosmic Ray Veto detector. Fermilab broke ground on Mu2e in April, and the experiment is expected to begin taking data in 2020. But it is already proving to be a boon for students seeking hands-on experience. About 25 NIU undergrads and graduate students in physics and engineering have worked on important aspects of Mu2e, including mechanical design of the experiment, testing of detector test-beam components and detector design and optimization. Four NIU faculty and six research scientists also collaborate on the project, along with scientists from across the world. The new grant will support two undergrads and three to four graduate students each year. 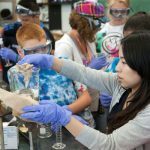 Fermilab also will provide funds for two engineering students per year, and NIU is kicking in undergraduate engagement funds to support students. In addition to the latest NSF grant, professors Michael Eads in physics and Nicholas Pohlman in engineering received a U.S. Department of Energy grant last year of $325,000 that also will boost NIU’s role in another particle experiment at Fermilab known as Muon g-2. The funding will be used to support NIU’s team contributing to the ATLAS experiment at CERN’s Large Hadron Collider (LHC). The LHC is the world’s most powerful particle accelerator, famed for having discovered the Higgs boson in 2012, an achievement that led to the awarding of the Nobel Prize for Physics to theorists who first surmised the particle’s existence. The LHC’s 17-mile long ring sits in a circular tunnel about 110 yards underground. 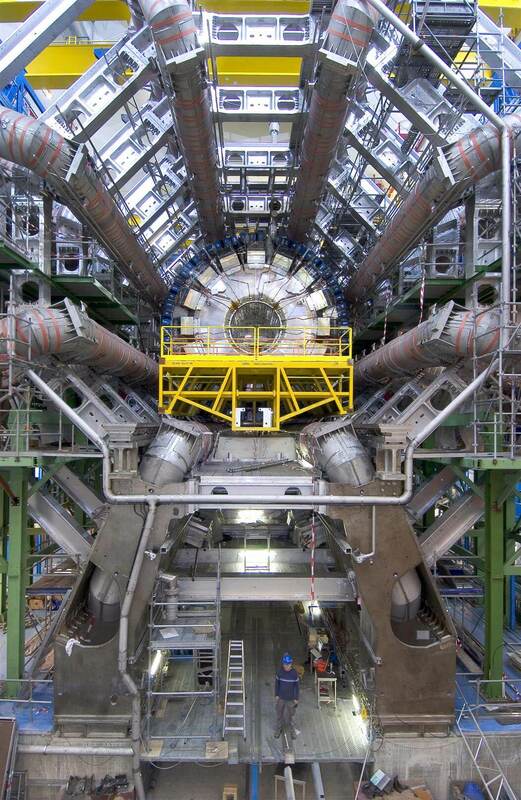 The ATLAS detector, which is located within the LHC tunnel, took an international team of scientists and engineers two decades to design and build. It has the shape of a barrel and is almost as long as an Olympic swimming pool. ATLAS’ superfast electronics and computing systems are capable of examining with minute detail the outcomes of billions of proton-on-proton collisions every second to search for extremely rare phenomena. “The aim of the ATLAS experiment is to understand the most basic workings of nature by recreating, for fleeting instants and in tiny volumes of space, the conditions from which the universe evolved after the Big Bang,” Chakraborty says. NIU joined ATLAS under Chakraborty’s leadership in 2006. The university’s ATLAS team includes two faculty members, one senior research scientist, one post-doctoral researcher, four Ph.D. students and one undergraduate. In addition to funding ongoing research activities, the grant will allow for the addition of another post-doctoral research associate. CERN also provides substantial funding to support travel by NIU personnel. The funding will be used to bolster NIU’s participation in the Fast TracKer upgrade, designed to dramatically improve the ATLAS detector’s ability to extricate scientifically important signal from a noise-dominated deluge of data. It will employ real-time tracking of charged particles traveling at nearly the speed of light. The tracking will help scientists find what might be akin to needles in a very, very large haystack. 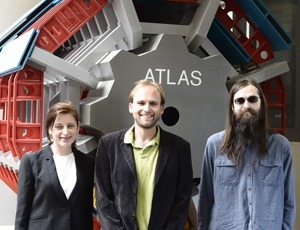 NIU postdoctoral researcher Nancy Andari (left) with professor Jahred Adelman (center) and Ph.D. student Blake Burghgrave at CERN. 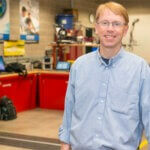 Adelman joined the NIU faculty last fall. He brought with him several years of experience on ATLAS as a post-doctoral researcher at Yale University and assumed leadership of NIU’s Fast TracKer involvement using startup funds from the university. Adelman also serves as the deputy leader of the NIU ATLAS team. Together with other members of his group, he is deeply involved in using the Higgs boson to probe and test the Standard Model.